Summer in the Lakes Region is blissful, sunny days spent on the water, boat rides, and everything moving at a slow summer simmer. Summer may be the Lakes Region’s best-known season, but wrap the hillsides in spring green, the brilliant colors of fall or a thick blanket of snow, and it is every bit as magical. 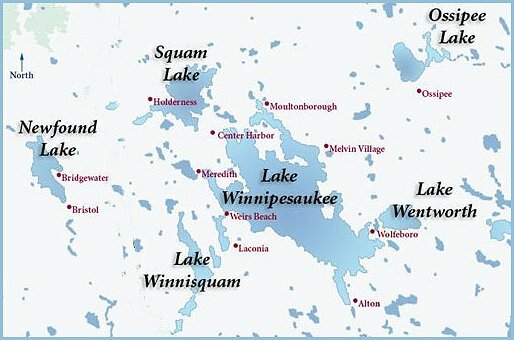 While there are many lakes and ponds in the Lakes Region, Lake Winnipesaukee (The Smile of the Great Spirit) is the largest lake in the state. Located at the foothills of the White Mountains and surrounded by three mountain ranges, the wooded shoreline and crystal-clear waters of this spring-fed lake make it a place to rest and relax in beautiful surroundings. Quaint and picturesque, Meredith was awarded the 2005 Champion Town by America in Bloom, a non-profit organization dedicated to promoting nationwide beautification, and recognizing personal and community involvement. Endless lake and mountain vistas and unsurpassed natural beauty makes the Meredith area one of the most popular destinations on Lake Winnipesaukee. Truly the heart of the Lakes Region, Meredith is the latchkey to the spectacular White Mountains of New Hampshire. Spindle Point features the only lighthouse on Lake Winnipesaukee. It is rumored that the costume designer for the Wizard of Oz designed the witch's hat after seeing this conical stone lighthouse during a visit to Meredith. The Neal Shore area of Meredith Bay is a particularly beautiful location. Facing East, sunrises and sunsets over the bay are truly breathtaking. The City on the Lakes - The City of Laconia is located in Belknap County in the Lakes Region of New Hampshire. The city is located on four different lakes: Lake Winnipesaukee, Lake Opechee, Paugus Bay and Lake Winnisquam. The City is bounded on the north by the town of Meredith and Lake Winnipesaukee, on the west by Lake Winnisquam. Laconia is comprised of three distinct areas: the Downtown, Lakeport - a residential section and Weirs Beach - a beach resort community located directly on Lake Winnipesaukee. Centrally located, Laconia is just 10 minutes to Gunstock Mountain Recreation Resort, 45 minutes to the White Mountains, and 1 hour to the Seacost. Laconia is home to the Laconia Motorcycle Rally - the oldest in the world,; is 12 miles from Loudon where Nascar racing takes place and is home to the Annual Sled Dog Derby and the Winni Fishing Derby. Three private two-bedroom cottages on the shore of Lake Winnipesaukee. Your own beach, dock and cottage - perfect vacation fun!